The film is Comedian Harry Hill’s big screen debut and stars a wealth of British acting and comedy talent including Harry Hill (TV Burp, Whatever Happened to Harry Hill? ), Julie Walters (The Harry Potter film series, Mamma Mia! ), Jim Broadbent (Moulin Rouge!, Gangs of New York), Simon Bird (The Inbetweeners, Friday Night Dinner), Guillaume Delaunay (Murphy’s Law, Eliza Graves), Matt Lucas (Little Britain, Bridesmaids), Marc Wootton (Nativity!, Arthur Christmas), Sheridan Smith (Mrs Biggs, Benidorm), Julian Barrett (The Mighty Boosh, A Field in England) and Shingai Shoniwa (Magpie, Never Mind the Buzzcocks). Directed by Steve Bendelack (The League of the Gentlemen, Mr Bean’s Holiday) and written by Jon Foster and James Lamont of Armstrong and Miller as well as Harry Hill himself, this film is sure to promise high jinks, and crazy characters. In May 2013, the production visited Littlestone – on- Sea in Shepway where they shot scenes where Harry and his Nan arrive in an old car and stay at a B&B in the fictional village of “Black Pole”. Littlestone lies on the coast between Greatstone and St Marys Bay, and is a village with a sea wall, promenade, beach huts, lifeboat station and beach consisting of shingle, mudflats and sand. Nearby Dungeness is a popular film location having been used for a Nicki Minaj music video (2012), The Poison Tree (2012) and Countrywise Kitchen (2011). The Harry Hill Movie was released in cinemas on December 20th 2013 and is now available to buy on DVD. 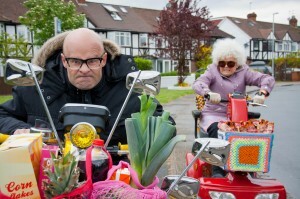 This entry was posted in Filmed in Kent and tagged feature film, Harry Hill, Jim Broadbent, Julian Barratt, Julie Walters, Littlestone- on- Sea, Matt Lucas, Matthew Hall, Sheridan Smith, Shingai Shoniwa, Simon Bird, The Harry Hill Movie film locations. Bookmark the permalink.